Have you jumped on the coconut oil bandwagon yet? It’s a trendy topic these days. 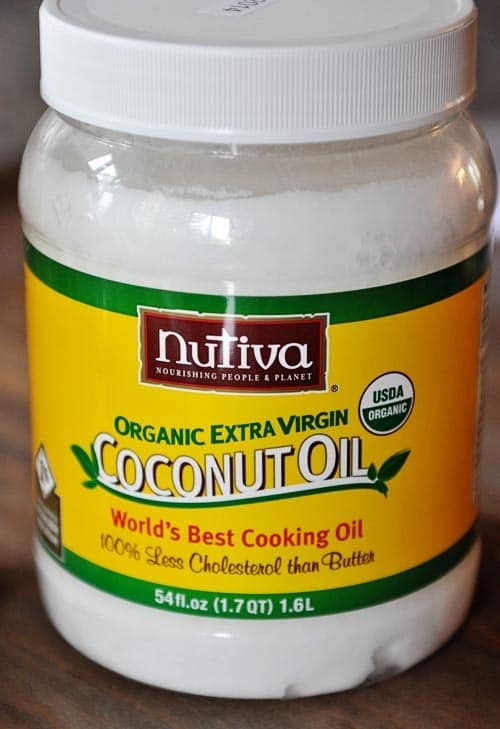 Today, I want to talk about how I use coconut oil in cooking and baking. I am not here to tell you whether or not coconut oil is healthy or whether it will cure your gout or whether or not it will help us all lose 33 1/2 pounds or whether or not you should swish it between your teeth and rub it on your feet. You can decide for yourself whether or not you feel coconut oil is the new superfood or a miracle oil. And heaven knows there are about a million and one articles online that will convince you in any direction. The basis for its popularity, I’ve learned while reading up on it over the last year or so, has to do with the presence of lauric acid and the fact that it is made up of medium-chain fatty acids which are smaller fat molecules. It’s a popular oil for vegan cooking (which I don’t do a lot of, let’s be serious) because it isn’t animal-based and if you follow a paleo diet, I’m pretty sure it’s widely used for that lifestyle, too. So why do I use coconut oil? To be honest, I tried it out initially because of all the buzz. And I loved it. It is solid at room temperature and doesn’t need to be refrigerated which I like. It also melts at a low temperature (around 70 degrees or so) – I found that out after my house was a sweltering 82 degrees this summer and I glanced in my pantry and saw my jar of coconut oil was completely liquid. Hot! I love the flavor of extra-virgin coconut oil (I’ll talk about the two types in a second) and the fact that refined coconut oil has a neutral taste. Also, it has a high smoke point which means it’s good for frying or other recipes where you need really hot oil. Before I get to how I actually use it and for what recipes, for those that may be new to coconut oil, here’s a super-duper brief overview. There are two main types of coconut oil. Refined/expeller-pressed and unrefined/extra-virgin (or virgin). Refined or expeller-pressed coconut oil is refined from dried coconut and doesn’t taste or smell like coconut. Because it is processed, it does require chemicals and isn’t considered as pure or life-changing as the extra-virgin oil. UPDATE: Thanks to those of you who corrected me – some brands do NOT use solvents for refined coconut oil including the one from Tropical Traditions which I use so check the brand you buy to be sure. This is the oil great for deep-frying because it can handle higher cooking temperatures. It is usually a bit cheaper than unrefined coconut oil but check sources/products closely because quality can differ significantly among brands (I’ll give some sources at the end). 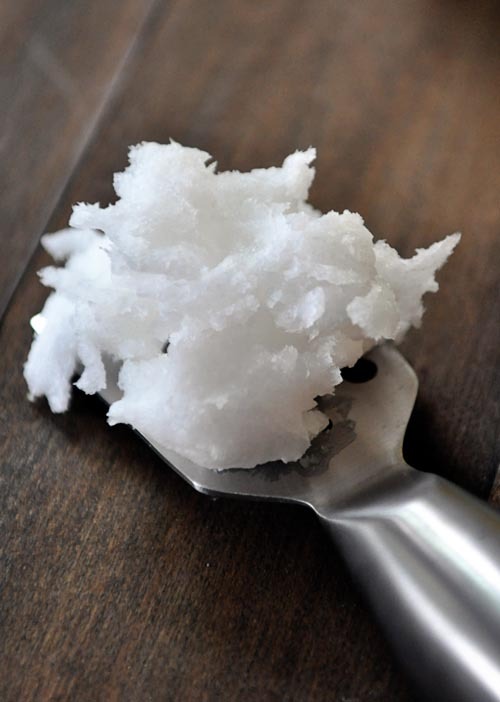 Unrefined or extra-virgin (or virgin) coconut oil is pressed from raw, fresh coconut and doesn’t require the use of any additional chemicals (like the refined coconut oil does). This type of coconut oil has a coconut flavor and smell; pretty mild in my opinion but does great things to enhance the coconut flavor in baked goods. Ok, so how do I use this stuff? I keep a jar of the refined coconut oil next to my stove. I use it most times I’m adding a bit of oil to a skillet or pan (say, for scrambling eggs, sauteing vegetables, starting out a recipe that calls for softening onion and garlic, frying up things like these quinoa patties, sweet and sour chicken, etc.). Refined coconut oil is a pretty one-dimensional oil, in my opinion, but great for the simple purposes of sauteing and stir-frying. The unrefined, extra-virgin coconut oil is more fun (no offense, refined coconut oil). And I don’t want to embarrass my husband, but I’ve found Brian on at least two occasions smelling the open tub of coconut oil with great contentment as he’s putting it away. He says it reminds him of a tropical vacation. Not that we’ve ever gone on one of those but whatever. I know there are a few more recipes I’ve used it in but since I’m drawing a blank, I’ll add them in the comments if I think of them. I’m still a bit of a newbie to the coconut oil world (about a year, I’d say). I’m not using coconut oil exclusively, either. Sometimes I just really need butter. I love butter (no haters, please). And I like to think of myself as a lover of all oils (except shortening, I don’t like it much). But coconut oil is definitely moving it’s way up in what I grab when I need something to cook or bake with. As an FYI, I have tried using it in pancake and waffle recipes and it’s caused some major stickage to my griddle so I need to figure out how to make it work there. Also, it’s important to note that if you have melted coconut oil to liquid form and add it to other liquids (say, milk or water or whatever for a muffin recipe or something similar) and those liquids are cold, the coconut oil will solidify into small clumps and won’t stay liquid like vegetable oil. It won’t necessarily ruin the recipe, it’s just something to be aware of. Since I can’t find coconut oil where I live (at least not without selling my firstborn child to afford it), I’ve bought it with great success and joy at Tropical Traditions (they often have coupons and deals for a buy one, get one free type thing, or free shipping, etc.). I’ve also had people who love me that live near a Costco pick it up there and I’ve bought it on Amazon, too. 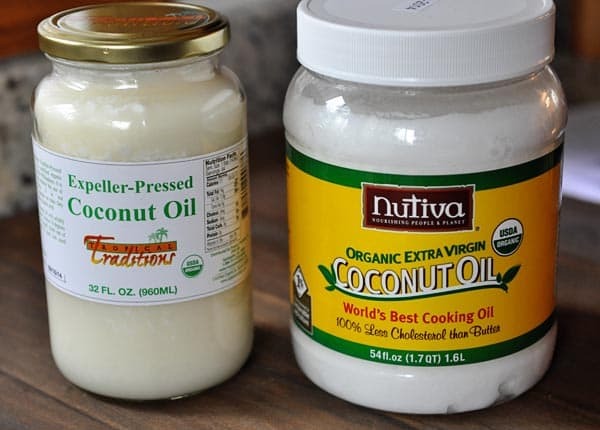 How do you use coconut oil in cooking and baking? Also, if you don’t mind, please reference any great sources for purchasing it in the comments if you have any others to add. I’m really curious to know how many of you are using the almighty coconut oil! We use coconut oil in place of butter for most things. I add a wee bit of kosher salt to the oil to make it more like butter. Great on toast or vegs, but my favourite use is on slices of fridge cold banana bread. It goes on smooth but the cold of the banana bread makes it harden to a crackly topping. Yum! I am loving this oil. It seems to add a little extra to everything I have added it to ! Can I make a roux for homemade mac& cheese with it ? I enjoy it as a spread on toast ! ( especially with heavy shake of cinnamon.) It is amazing in all my cakes, etc. Norma Curran – I am not sure since I haven’t tried it. You could try a google search for Mac and cheese recipes using this oil in the roux. Good luck! I did use as a roux . Excellent results ! Works great with cakes as well. Complete success in every recipe so far. And it is wonderful to use when sauteing greens . I use it to make my taco shells. Just fry up some corn shells in it and it is so stinkin good. Originally I just used it because it finally solved my guilt problem from frying the shells in vegetable oil. Now I use it because it is so yummy!! I do chicken tacos with all of the fixins and use these shells. The coconut flavor adds a little sweet to the taco. It has made my favorite meal even more favorite-y. omg, thank you so much for posting this! It is going to be so helpful when I get Coconut Oil online! Astonishing! I’m a new user and want to use it for baking cakes = but just do not get the cakes light and moist. So what can I do? What are you replacing it for? Hi Heather – it’s really a matter of experimenting. I haven’t tried using coconut oil in cakes. It doesn’t whip up like butter (to create the air that makes cakes light and fluffy) but you might try googling to see if others are using it in cakes and what their experiences are. I trade straight across for butter & other oils in baking. I have superior results. Is great for rouxs, light spread on toast (fab with cinnamon), popping corn. So far so good ! I have purchased online at Tropical Traditions, and World Cost Plus. Wherever the best bargain is. Greetings from Fort Lauderdale, FL! I started using CO about a year ago. I bought it for it’s health benefits, but at first I had to experiment to find where I could use it without the coconut taste. So, the refined is good for frying eggs, etc. I use it for popcorn, too! The first time I used it to make popcorn and it started popping I thought, “That’s what the movie theaters used to smell like!” I couldn’t wait to dig in. I now have both refined and virgin on hand at all times. I also use it for a moisturizer. I have a glass custard cup on the bathroom counter that I add lavender and frankincense essential oils to. I use that after cleansing my face every day. I also use that all over both feet to keep smelly feet at bay! When I am using it for cooking, I just rub any I get on my hands all over my hands and arms. I have 4 cats and feed 4 more outside cats and most of them LOVE it! One of my cats cries for it and drools waiting for it! (He is also a butter lover/thief) As most months the CO is liquid here, I give it to them on a teaspoon and they lick it off. I have had no need for de-worming those that eat the CO. I do read and watch videos regarding the health benefits and I started an elderly friend on its use every day. I also am trying to find ways to include a sufficient amount for health benefits without having to eat it straight off the spoon. I have trouble with that – not the taste, the idea of eating oil! I know it’s irrational, but I find it hard. I added about half a teaspoon of the refined CO to my coffee this morning. It is a part of a Bulletproof Coffee recipe, there are a couple of those recipes. I urge all reading this to learn of the health benefits and uses for CO and USE it! Just Google uses for Coconut Oil, sit down with a drink, relax, and get ready to be wowwed! I bought it here first at Whole Foods. A 14 oz jar runs 7.99 for Virgin CO. I use a lot of it, so for body and frying and cooking in general I use the refined from my regular grocery store, Lou-Anna brand. It is very reasonably priced for a 30 oz jar. If your store doesn’t stock it, ask the manager to stock it. Hi Mel….loved this blog! I have my own Wildtree business (if you aren’t familiar, we are a Certified Organic, Non-GMO Direct Sales company with Independent Reps) We are introducing our brand new Organic, Expeller pressed, refined Coconut Oil in just 3 DAYS! So excited! If anyone is looking for a source to order an awesome, pure coconut oil for cooking and baking, check out my website, read up on all of our other fabulous products while you’re there (almost 200 total!) (6 new ones, including the coconut oil, are available 4/27) and order any time!! Message me if you have any questions! Thanks! I have tried cooking with coconut oil but I find that it splatters. Am I cooking at a temp that is too high or is there something wrong with my coconut oil? It is Nature’s Way Coconut Oil, Extra Virgin. Hi Harriet – I don’t think you are doing anything wrong. I get splatters with coconut oil and other oils, too. Have you ever tried one of those splatter screens? They help minimize the mess and hotness of splatters. I started using coconut oil this winter in the shower to shave with and put all over after turning off the water. It’s amazing! The closest shave ever with no pit rash after and no itching as it begins to grow out. It got rid of my painful winter rash everywhere a seam touches my legs. Added bonus…if you don’t scrub it off you have already put on your deodorant!! Will probably add the other ingredients for sweaty summer. Have read so many things about how good it is to take it daily and people loving it so much they eat just dig into the tub and eat it by the spoonful but am having trouble getting it down. I got the Tropical Traditions Gold and it doesn’t smell or taste like anything coconut I have ever had before. I do have to admit that I am the odd duck that is overweight but can’t stand oily foods. IE: love Ken’s Raspberry Walnut Vinaigrette but pour the oil off the top because I can’t eat greasy salad greens!! Give me a breadstick and I will dunk it in garlic butter all day long but give me seafood swimming in butter or to be dunked in butter and I gag! I can’t imagine drinking hot chocolate with oil floating on the top. I tried it in oatmeal and ended up eating it in just a couple of huge bites to choke it down. Scrambled some eggs using it and hated the taste. I think if I had been raised using EVCO then I might like the flavor but I guess I was raised with fake sweetened coconut flavored things and am really struggling to use it. I want the smell and flavor I am used to. I wonder if I added some coconut extract to it I would tolerate it better for oil pulling and general consumption outside of cooking? I’ve been thinking about giving coconut oil a try; I really want to stop using shortening. Butter doesn’t work in everything, and I don’t have the freezer space to try rendering my own lard and keeping it on hand. It’s nice to hear that you can use it for frying, too. I didn’t know if it worked for that or not. Does anyone use CO for your hair and if so, how do you use it? Thanks! Yes, I have used it once a week for about a year now as a pre wash conditioner. At lease 30 minutes before I wash my hair I apply about 1 tbsp. to my hair and pull it through the strands. When I wash my hair, I am generous with the shampoo to help remove the extra oil. My hair is so soft and shiny after using it. Had to post my favorite use of CO after I saw an article on Pinterest. I’ve been putting it in my black COFFEE and I LOVE it !!!! The article says some people will use a ‘bullet’ or an immersion blender to emulsify it, but I like it just plunked in and floating ( melted) on top! Tastes yummy and I love the oil that gets left on my lips! Great energy boost, too, especially if coffee happens to be the only thing you get for breakfast some mornings! I’ve also read articles that some people just eat a teaspoon or so just plain. Not sure I would enjoy it plain like that, but good info. I love to make cinnamon toast with coconut oil in place of the butter. Delicious. I picked up a bottle from somewhere abt a year ago and have been too afraid to open it due to not having a clue ‘how’ to use it, lol! I’m so glad I discovered your site! Now I can finally use it — unless it’s past it’s ‘use by’ date. I keep a small container of killer garlic oil in my fridge and use it all the time. Take a small amount of coconut oil and press a bunch of garlic juice into it with your garlic press. Use it in any dish that calls for oil and garlic, which is most of them that I cook! I love putting coconut oil in your baked oatmeal recipe. I either use it for the 1/2 cup oil, or use 1 full cup in place of the oil and applesauce. I love coconut oil! My husband loves pan fried chicken. He gets it only once in a blue moon, but when I make it I use coconut oil. It really works well! Y’all are making me feel a teensy bit guilty talking about all these healthy recipes as I make chili mac for dinner. Ha! I love your site and love all the comments on the CO post. I’ve been using it for a while now and this inspires me to use it more ways. I am dying to hear about your pie crust recipe using CO! And, at the risk of TMI…coconut oil has been a wonderful, natural lubricant instead of KYJelly or the like…a godsend for this menopausal gal. Thanks so much for your wonderful site and recipes!! I love coconut oil for freeing up seized chocolate. It makes it liquid and free again. A few people use it for oil pulling too (swishing it in your mouth) which offers a lot of health benefits. Mel – I received my apron today and I love, love, love it!!! Thanks so much! 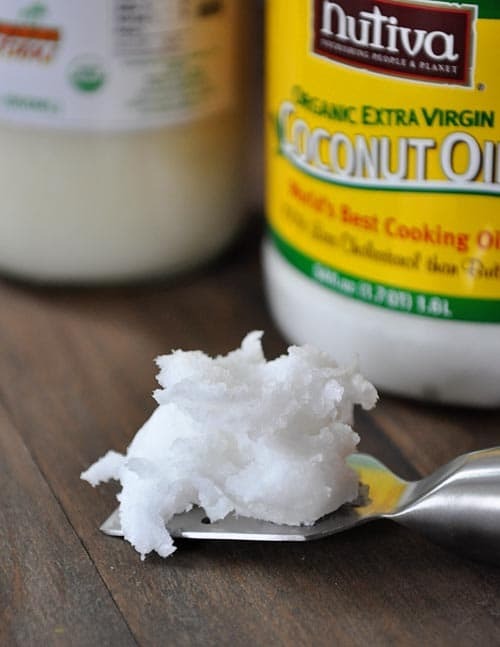 I use coconut oil in nearly everything – except salad dressing. I buy mine from Tropical Traditions. (I also use their palm shortening and moisturizers…) Mel, I’ve even used coconut oil in your recipe for pancake mix. It works just fine! I officially joined the coconut oil bandwagon! I found it in my small town north central MN grocery store and it was calling my name. Thank you for such a great blog, your blog is my favorite go-to!! I LOVE coconut oil and love knowing that you use it too! It’s the only oil I use in the kitchen. I only use butter in baking when it will really affect the flavor, since I can get good quality coconut oil cheaper than organic butter. So I save the butter for spreading and go crazy with refined coconut oil! I buy it in bulk (50 lb pail or 7 lb jug) from Soaper’s Choice. It’s a soapmaking company so their oils are cheap, but they have food grade organic oils as well. You should definitely check them out! Even with shipping it comes out to be much cheaper than buying elsewhere (the 50 lb bucket is under $2/lb). I heard about them from a blogger I really respect (Kitchen Stewardship) who did her research on them, so I trust the quality, and their refining is done without solvents. my daughter uses it for her hair, hubs fries eggs with it, last night I made popcorn with it after reading the comments, it was very delish! Some commenters mentioned oil pulling- what is that?? You can use coconut oil to make magic shell for ice cream. It is To. Die. For. Seriously. Melt 1 1/4 c chocolate chips and 2 Tbsp coconut oil. Or you can forget the ice cream, just eat the magic shell. Yum. I know many have mentioned it, but POPCORN! I have a love affair with popcorn. I used to eat it almost every night (the light kind that is made in the microwave). Well, when I started learning about food, I learned that those are incredibly unhealthy, and also contribute to infertility. I always say Codi took so long to get to us because of my microwave popcorn addiction…hahaha. Anyway, I gave that up entirely but missed my popcorn. I always felt guilty using too much butter to make the air pop kind. Well, 2 tablespoons of Coconut oil, to 3 T. kernels, and popped on the stove. Then I grind Himalayan salt over the top, and I am in HEAVEN! I adore it. I’ve got your back. I am a Costco fiend, and if you ever need the big tub, let me know. It is by far the best product for that price! The husband is from the Fiji Islands. He’s been using coconut oil since he was a baby, I swear that’s one of the reasons that Islanders have such gorgeous complexions. We use it as a lotion, mixed with arrowroot and baking soda for deodorant, diaper rashes and eczema, as a carrier oil for essential oils, and in all our cooking. We are fortunate to be able to buy the big tubs at Costco now, though not too long ago my sister-in-laws would send us some from Australia. My favorite ‘mel’s’ recipe that I use coconut oil in is the chewy oatmeal/coconut cookies. I go half and half with butter and coconut oil. Yummy! We use coconut oil in our curries and roti, flat bread Fijians eat curry with . . like a utensil and lots of fish dishes. Mel! I love your site. But I want to tell you that while I was reading this post, an advertisement for yogurt popped up on my screen and froze what I had been looking at. I could not close the window myself and it wouldn’t close for 10 or 5 seconds or something. That kind of advertising is a little much. it should not impede the function of your site, in my humble opinion. That’s just my two cents. Hi Stephanie – I appreciate your feedback. I’m not always aware of 100% of the ads that are being served on my site at a given time but I agree with you that I think pop up ads are annoying. I’ll do some looking into it. Thanks! I bought some coconut oil just because I’ve heard so much about it. But then the first time I went to use it, I didn’t know if I should melt it and then measure it, or just measure it in its solid state? I was making peach muffins and it called for 1/4 cup coconut oil. Good question, Christine – I remember thinking the same thing! If I use coconut oil in breads/muffins/cakes, etc., I scoop it into a liquid measure and melt it in the microwave on low power (sometimes I have to add a bit more to get the exact measurement after it melts). If I use it in cookies that call for softened butter, I just use it as is without melting. I have a fabulous easy, healthy chocolate recipe containing coconut oil! Melt the coconut oil and mix in all the remaining ingredients well. Scoop into moulds of your choice and freeze for 20 minutes. Keep the chocolate in the fridge. I’m sure any nut, raisin, cranberry or ingredient of choice will work well. I forgot to mention in my above post that the LouAna coconut oil label reads “do not use for deep frying”. Mel, I came across 100% pure LouAna Coconut Oil at Walmart about a month ago. I had noticed you had mentioned it in several recipes you posted. My thoughts were: “I don’t want everything taking like coconut even though I like coconut. Why is Mel using this product so much?” If Mel uses it, it must be a very worthwhile product. So I went over and read the label and discovered much to my delight that the label read “refined from the meat of mature coconuts so there is no coconut flavor or aroma”. I brought it but until this post, it has set in my food cupboard unused. What a great post you created! I will refer to this post and re-read the comments often as I incorporate this new product into developing a new cooking style. After using LouAna brand, I will experiment with some of the other brands mentioned. I am also excited to try this as a skin care product. Thank you for all your hard work, teaching, and willingness to share what you know to help us make better, wiser decisions for our families when cooking. You rock! I recently ran across an article written by a woman doctor about coconut oil. Her husband had Alzheimer’s and was not doing well. She started adding coconut oil to his meals and the Alzheimer’s has almost reversed itself. So, not only is it very tasty, but it has the potential to reverse this deadly disease! This was just one woman trying to help her husband but it looks promising! I wish I had known this before my mother died from ALZ.. It is so yummy in your sweet and sour chicken and we love it in your orange chicken that you bake in the oven. lOVE IT! I made a coconut lime sugar scrub (from our best bites) that I absolutely love. My teenager-ish boys seemed to have good luck with using it as a moisturizer to help restore moisture balance to their faces and reduce acne. We haven’t used it for anti-fungal purposes, because we “accidentally” discovered that vapor rub works wonders for athlete’s foot and other similar fungi. I purchased mine at Honeyville Grain. I’ve used coconut oil for 7 years. I replaced canola oil with coconut oil and have never switched back. I use it in all of my cooking, including my smoothies. The trick to making smoothies without the chunky bits? Warm a small amount milk, add 2 Tbsp. liquid coconut oil. Blend well to emulsify the mixture together. Once you have done this you can add frozen fruit, Greek yogurt, greens etc. This gives me enough energy so I am not dragging myself and looking for a quick pick me up mid afternoon. I see a lot of people saying its good for popcorn. Does it matter which kind? Extra virgin or pressed? I use the Vitacost brand CO in literally EVERYTHING. I’ve had no failures, and I’ve used it to replace shortening, butter, and olive/canola oil. Works everytime! In bread, brownies, eggs, cookies, rice, popcorn, pancakes, muffins, to grease pans- anything. I love the stuff! I love coconut oil spread on warm toast! Mmmm! I love LOVE to fry things in unrefined coconut oil. It gives it this light, crisp, nutty flavor. Our favorites are chimichangas, quesadillas, and fry bread. I also use it as facial moisturizer and body lotion, oil in a hot oil treatment on my hair, rashes, cradle cap, the list just goes on and on! I read in one of the comments that it doesn’t go rancid. Sounds like it would be good to use on cast iron skillets. Besides slathering it all over sun-kissed, dried out skin, I use it to make homemade popcorn in a pot. It is so delicious. I also use it in making muddy buddies. I put a small spoonful when melting the chocolate and peanut butter. It seems like whenever I throw it in something I always get people asking what the mystery ingredient is. Thank you so much for posting this. I go through phases when it comes to cooking and baking and I have never used coconut oil, but have been wanting to; I live in timbuktu and haven’t been able to find it anywhere, so thanks for the link. Also looking forward to the pie crust, hubby’s B-day is just around the corner he wants Coconut Cream Pie instead of cake this year, so I’ve been searching for recipes. Thanks again!!! Shelley mentioned using it in bread. It is an amazing dough enhancer–I have used it in place of any oils and vital wheat gluten with fabulous results. 2 TBS to 1/3 cup per two loaves. 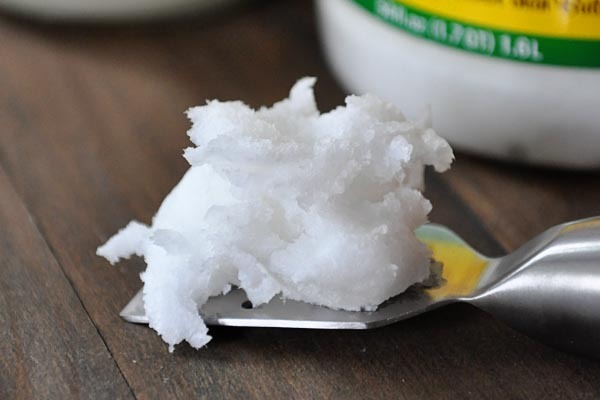 Hi Mel, I switched over to coconut oil for cooking about 2 years ago when I read reports on its positive affect on diseases connected to aging. I’m not that old (lol) but thought I’d be proactive. I took all the hydrogenated oils out of my kitchen — all of them: Crisco, Wesson, canola, etc. — and kept only olive oil, butter and coconut oil. I also have the nut oils and sesame oil for occasional use, but I understand that they are healthier versions than the old standbys. I do exactly what you do — it’s my go-to oil when I sauté veggies and I keep it by the stove. I enjoyed reading the comments to this post and will start to experiment with the other uses of coconut oil — outside of the kitchen. Didn’t see any mention of the “butter” we now use for toast. Since my husband went dairy free we found this coco oil spread & it is the most yummy butter replacement for toast. My kids don’t care for it for some reason but hubby & I love it! I’m wondering right now tho that if we poured some regular jarred coconut oil in a tub & kept it in the fridge if it would be similar?? Worth a try! Cheaper & less processed. Started using in place of butter on steamed veggies and my kids have been eating more of them. I use only unrefined oils as much as I can. Often I mix oils, or partially substitute and usually have success. Baked goods still come out a little dry for me with it but I am working on it. It has also been a life saver for sun burns (prevents peeling with aggressive application), eczema that has not responded well to hydrocortisone, and general dry skin issues. Great stuff. I really like using coconut oil for many different things! I used it in place of the 1.5 cups of vegetable oil called for in your “unbelievable carrot cake” with fantastic results! So good! I also use it on my skin as a lotion and in my hair as a deep conditioner. Very versatile…great stuff! I have used sporadically in my home cooking and baking, but use it all the time when cooking/baking for my vegan clients; scones, granola bars, etc. I will be making better use of it at home after reading all the great suggestions…I want some popcorn like NOW, thank you very much! I LOVE this stuff! I like to add it to things here and there, especially for my babies, just for the added health benefit. The most common being oatmeal, but I’ve also even melted a little, then quickly stirred it into yogurt. I got into it from a shake recipe that my brother-in-law wrote that it pretty wonderful. My favorite use for it though is in macaroni and cheese. A dish that used to be my gross cop-out meal has now turned into something that I happily feed my children. I still use regular boxed Kraft, but I add in some sweet potato/butternut squash puree (I freeze it in ice cube trays and put 2 cubes per box) and use coconut oil and coconut milk instead of the usual butter and milk. It makes me feel like a good mama when my kids gobble that down and ask for seconds and thirds! I live in Texas where room temperature is below 70 only in the winter months. Consequently, my coconut oil is rarely solid. I do use it for sauteing vegetables but have never tried baking with it. I also add about 1 tablespoon to our great dane’s breakfast. He is prone to dry, itchy skin, and the coconut oil has greatly improved the condition of his coat. Hi Mel, I am from a state called Kerala in India, which means “land of coconuts” in our language. So the only oil I seen my mom used for cooking is coconut oil. After coming to US, I started using other oils, but I still like the smell and flavor of coconut oil more. You can use it for any Indian dishes, its perfect..gives a little more that authentic flavor of the dish. Hope this helps…!!! I love coconut oil. I use it in everything too. I first ran into it when I was doing a Paleo Whole 30 eating challenge. Then afterwards I used it in place of vegetable shortening in a cookie recipe I have it was fabulous and I guess I felt probably healthier than hydrogenated shortening. Now I use it in place of most oils in all cooking and I use it as a skin care product for dry skin. LOVE IT! I use coconut oil when i’m baking my sandwich bread. The recipe needs only a couple of tablespoons of oil so I use coconut oil. Its such a small amount that you can’t taste the coconut and it helps with the rise. I learned about coconut oil because of homemade Magic Shell chocolate topping. Not necessarily a healthful recipe, but delish! I find it at my local grocery store, as well as at Walmart. I have been on a paleo diet for a while and I use coconut oil for everything. Love it! Have found that you can find it at walmart pretty cheaply now. Also, we are military, and the commissaries are now carrying it. I love using coconut oil and with this post I’ll be using it more and more. I have loved it in your Hawaiian haystacks. Can you say dessert for dinner. Our family was licking the pan clean. Great post!! I have a mild coconut allergy (some congestion and mouth itching). Does anyone know if coconut oil would be trouble for me? The only thing I will use now to roast sweet potatos, it gives them amazing flavor. I don’t need to add anything else. Thanks for this post, and for all the wonderful comments! I have some coconut oil in my pantry and in my bathroom, but have only used it a little bit. I appreciate the suggestions in the comments…especially the one about anti-fungal since I have some sort of thing on my big toe…I am going to give it a try to see if I can kill it before going to the doctor next week! You don’t want to refrigerate it because it becomes too hard. It naturally melts at 76 degrees and it doesn’t clog your arteries like other fats do. Oh, gosh, I love coconut oil so much! I just use the extra virgin all the time, we really don’t notice any flavor it might impart, though I wonder if people that don’t like coconut flavor at all might notice it more than we do? We also use it as diaper rash ointment, my second baby used to get bad rashes quite frequently and we found that coconut oil was better than any of the store bought stuff we were using. Plus, it made her smell deliciious :). I love butter too, don’t worry about those haters! No it doesn’t go rancid, and it is anti-fungal, anti-bacterial, anti-aging, and anti-viral, so it’s perfect for your skin. I slather my whole body in it after I shower and it’s the only moisturizer I use on my face. I put some coconut oil in a smaller jar to keep in my bathroom and I have the bigger jar in the kitchen. The one girl says she uses it for lotion on her face body ect.. and that it lasts forever. Doesn’t it go sour or ransom if not used or refrigerated? Can I use refined coconut oil in place of shortening in my cookie recipes? Or use EVCO? Even if it is not solid when I’m using it? Been using and substituting coconut oil for about 6-months. LOVE IT! I buy the extra-virgin at Costco. Great deal. I love coconut oil and use it in all the ways mentioned previously, but I only buy the unrefined virgin type. The best place for me to get it is Vitacost.com online, and I buy the Vitacost brand because the quality is comparable to other pricier brands. You can usually get it on sale for $18 for a 54 oz jar, and you get free shipping if you spend $25 in Vitacost products, which is very easy to do. One other thing I really like about coconut oil is that when you use it in frying or sauteeing foods, it doesn’t stink up your house like vegetable oil does. It leaves a clean fresh scent. I LOVE LOVE to use it when I am making popcorn on my stove. Adds a subtle sweet flavor and I just can’t use regular oil anymore. It is absolutely delicious!! I discovered coconut oil when I had to give up dairy… But I use it in apple crisp and rice krispie treats. Just yesterday I used it for roasting sweet potatoes and greasing muffin tins to make egg muffins. I use coconut oil for almost all of my baking. I also like to use it for popcorn – sprinkle with nutritional yeast & a little salt – yummy! I am with your husband – LOVE the smell of the virgin oil! I purchase mine from Bountiful Baskets Co-op – about $20 for 64 oz. of organic oil. So yummy spread on toast with a little honey drizzled on top…..mmmmmmm….. I love coconut oil! My family is dairy free due to food allergies so I use coconut oil in just about everything. This may sound strange but I put a spoonful in vegetables. My 1 year old is teething and wants to eat purees mostly and no veggies. So I steamed carrots, cauliflower, broccoli and peas. Added coconut oil, splash of half and half and a little cheddar. Blended it up and he gobbled it down! It seemed to make the veggies sweeter. 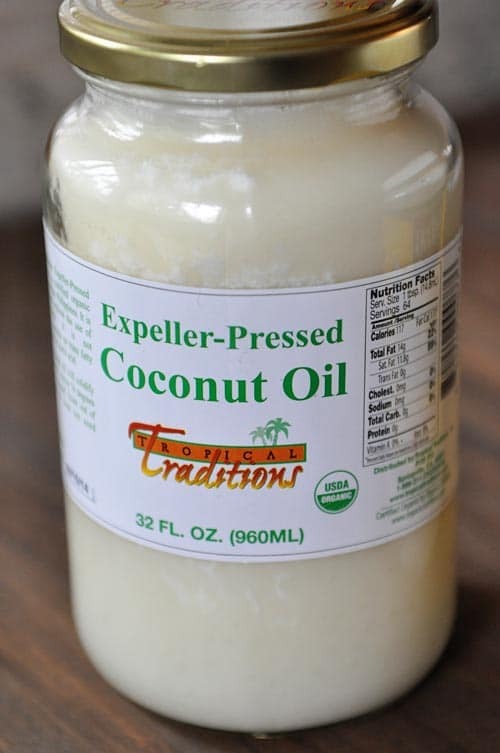 I love the expelller-pressed coconut oil because of its health benefits and neutral taste (EVCO is too strong of a smell and taste to be multipurpose in my opinion). We love that it’s safe for higher temperatures on the occasion we fry or stir fry in it too! We use it in place of “vegetable/olive/canola” oil in any recipe (but if the recipe calls for butter, we still use butter then). However, I wanted to correct something in your write-up. You stated expeller pressed coconut oil uses chemicals, but that is not true of all brands. The brand you show does not for example. From their webpage: “Tropical Traditions Expeller-Pressed Coconut Oil DOES NOT use solvent extracts. It is made the “old” way by expeller-pressed mechanical extraction.” Some expeller-pressed do use chemicals, but I buy TT on purpose because they don’t. I have used it in your zucchini bread and it’s wonderful!! I do use coconut oil. I have my awesome Coconut Chocolate Chunk Cookies on my blog that are fabulous with it. To be completely honest though it’s all the way in the back of my pantry and I completely forget about using it most days. I should stick in next to the stove as you mentioned. I currently have only ever purchased from Amazon. I use it a lot in baking. I love the flavor it gives to baking powder biscuits. I don’t even have to put butter on the biscuit! 🙂 I melt it and add it to my liquids I just add while my mixer is on and I’ve had no problems. Also have not had the sticking problem with pancakes waffles or crepes. I still spray surface with Pam first. Oh and I love popping popcorn with it again no butter necessary just add salt while it’s popping. So good! I put it in my oatmeal almost every morning and have used it instead of butter when making hash browns and eggs. I have used it instead of butter to fry eggs. I have also put about 1/2 t in my cup of hot chocolate. I’m so glad you covered this topic. I’ve been considering buying coconut oil but was overwhelmed by the choices (and the prices). This gives me a better idea of what to buy and how to use it. I’ll start with the extra virgin. Thanks! well, I couldn’t wait to comment and scream POPCORN, but I see so many have already mentioned this! It’s seriously the yummiest way to eat popcorn, it’s almost a daily after school snack around here. I put about 5 or 6 tablespoons in the bottom of my heavy soup pot, add 1/2 cup of popcorn. As it’s popping and once it’s finished, I shake the pot with the lid on very well to coat the popped kernels with the melted coconut oil. Season well with kosher salt, it’s beyond delicious! Also, I cook things like quesadillas in it, and basically anything else that I need to brown in a skillet. LOVE coconut oil! oh, and it makes a great nighttime eye cream! I use coconut oil in green beans, frying chicken, or anything really. I also put it on my grill to do pancakes and have never had it to cause a sticking problem. I do use the unflavored for all I mentioned. I love using the one that taste a little like coconut ion muffins, quick breads, etc. I have only bought it at Tropical Traditions. Great company and customer service. I love their testimony about how they started the business. I love coconut oil – I use Tropical Traditions expeller pressed oil in every recipe that calls for oil, for sauteing, etc. My husband hates coconut, so I avoid using the regular oil in my cooking. FYI, THEIR expeller pressed oil does not contain chemicals or solvents. I still use butter for cookies and such, and occasionally olive oil for certain things, but I mostly use coconut oil. I have a container of organic virgin oil in my bathroom that I use for eye-make up removal and for moisturizer, even for putting on minor scrapes and cuts. Seems to help them heal faster. I’ve also ordered organic expeller pressed coconut oil from Azure Standard and thought it was excellent as well. I use EVCO with Asian dishes. Particularly all things Thai, from stir fry to curries. Can even add a little into a pot of rice while it’s simmering. Coconut oil also pairs well with Caribbean food. Some jerk with a side of rice and red beans with EVCO, awww yaaa! And it’s stupidly good as spread on some toast. Have you tried Kelapo brand coconut oil? I tried other brands and discovered this one after my friend started working for the company here in the Tampa area a couple years ago. It has turned into my favorite and now it is the only brand I use. I know people have mentioned popping their popcorn in it, which I did for awhile before I found a brand new air popper at Goodwill, but now we melt it and pour it over the popcorn instead of butter. So good! It’s just like movie theater popcorn. The only baked good I’ve used it in is those applesauce oatmeal muffins you posted a few weeks back. I’ve made them twice already, very tasty. I love to pop popcorn in it with our Whirley Pop. Words cannot describe how amazing it smells! I love coconut oil. I’ve only dabbled a little into using it for baking/cooking. I usually make any muffins (banana, pumpkin, etc.) with coconut oil instead of veg. oil. Fabulous! What I really love this coconut oil for is ‘body lotion’. I use it everyday on my face, arms and legs. A little goes a long way, so the jars last forever. My skin loves it! I have never had dry skin after I started using this every morning. I also choose to use the organic/unrefined version. In short (kind of), I keep one container in my bathroom and the other in my kitchen. Such fabulous info and insights. I love it! We love to pop popcorn in coconut oil. Just add salt after popping. Yum!! Hershey’s chocolate cake is also wonderful. Like you, we love it in granola bars and eventhough the pancakes have sticking problems we love it in your oatmeal pancakes. I use my immersion blended to break up the nasty clumps it gets. I have used coconut oil in several of your recipes. My favorite is your sweet and sour chicken! it takes it to new levels of yumminess:)))))) I also, love sauteing chicken for a quick stir fry with just a little bit of salt and pepper in the coconut oil. I also use a half and half mixture of coconut oil and butter, for the cooks illustrated thick and chewy chocolate chip cookies. Angie – thanks for the reminder, I use it for the sweet and sour chicken, too (and just added it to the post!). Thanks for the correction on the Tropical Traditions coconut oil everyone! I’ll edit the post.